In the world of 3-row premium luxury SUVs, the 2018 Acura MDX ranks among one of the most admired and sought after vehicles in its class. As Acura's best-selling SUV, the MDX holds an important spot in the company's lineup. It has an excellent reputation for reliability and strong resale, which may explain its high repeat customer figures, not to mention enviable customer satisfaction reviews. The MDX offers plenty of interior room, a comfortable ride and excellent driving dynamics. Attractive styling and a competitive pricing only add to the MDX's allure, as does its standard set of driver safety-assist systems. 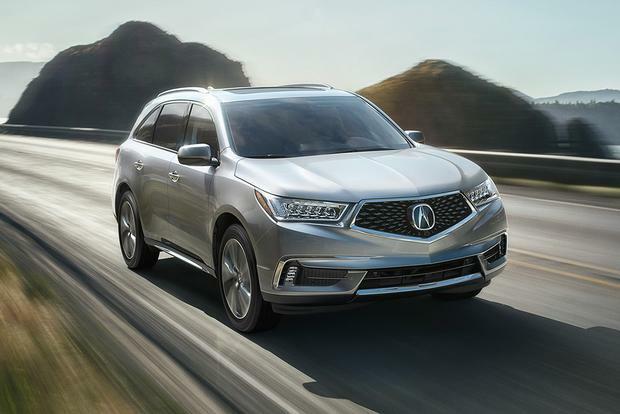 Despite improvements to its exterior, the MDX can still get lost in a crowd of similar crossovers; only one powertrain choice; Acura recommends premium 91 octane fuel, which is more expensive. 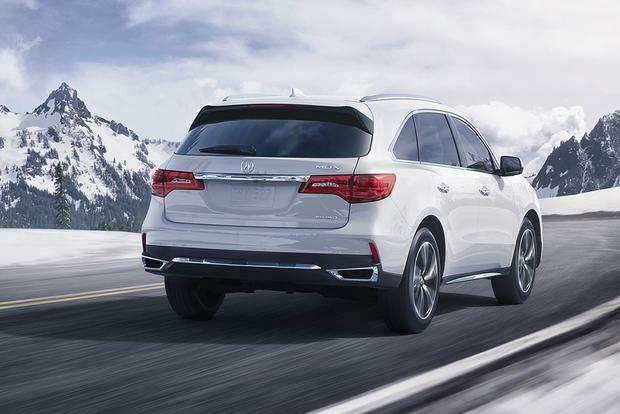 All MDX models come with the same 3.5-liter direct gasoline injection V6 engine (290 horsepower/267 lb-ft of torque) with a 9-speed automatic transmission. Front-wheel-drive models are rated to achieve 20 miles per gallon in the city, 27 mpg on the highway and 23 mpg in combined driving. Selecting available Super-Handling All-Wheel Drive ($2,000 extra) results in fuel economy figures of 19 mpg city/26 mpg hwy/22 mpg combined. 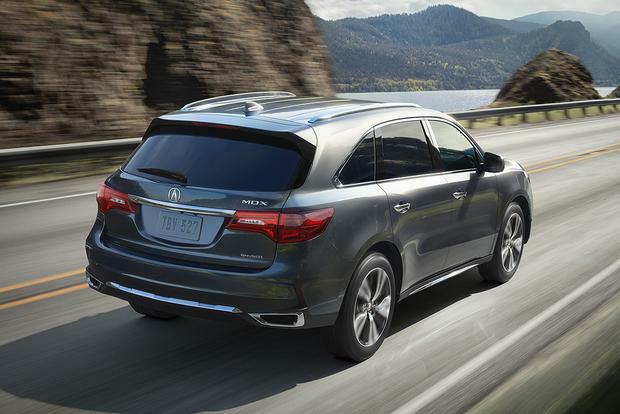 There is just one trim level of the MDX; three options packages can be added. Mechanical: 3.5-liter V6 with 9-speed automatic transmission and front-wheel drive. Add all-wheel drive for $2,000. Exterior: Full LED lighting; acoustic windshield and front side windows; roof rails; moonroof; Smart Entry Keyless Access System with front door and rear tailgate access; "diamond pentagon" front grille; 18-inch aluminum-alloy wheels. Interior: Three rows of seating; 50/50-split third row; 60/40-split second row with One-Touch Walk-In and Extended Slide; dual-screen center stack; leather seating surfaces; power windows and door locks; auto-dimming rearview mirror; 1.8 cu ft. of hidden storage beneath load floor; 12-volt outlet in cargo area; LED cabin lights; four door storage bins and bottle holders; center console with two cup holders, a sliding tray over a storage space and a tray under the sliding armrest; a compartment with a 12-volt outlet and a USB audio interface; leather-wrapped steering wheel. Comfort and convenience: Multi-view rearview camera; push-button start/stop; tri-zone automatic climate control; hill-start assist; heated power front bucket seats (10-way driver/8-way passenger); HomeLink; driver preferences saved on two unique keyless remotes; cruise control; electronic tilt-telescopic steering column; illuminated steering-wheel-mounted controls; sunglasses holder. 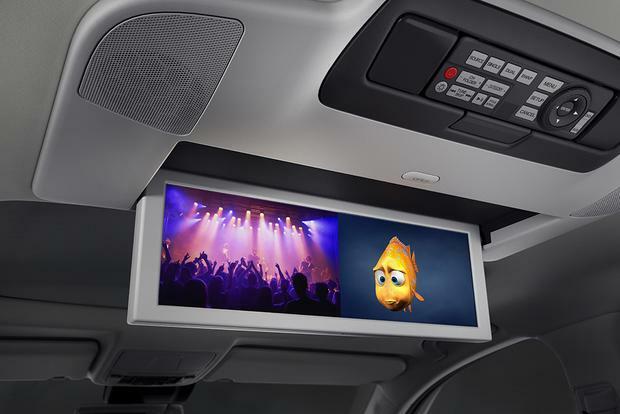 Audio and connectivity: AcuraLink with Aha mobile interface; Bluetooth, Pandora and SMS text interfaces; Siri Eyes Free; Apple CarPlay and Android Auto; 7-in On Demand Multi-Use Display (ODMD 2.0); Acura 8-speaker audio system with 432-watt amplifier, single-disc CD player, AM/FM/SiriusXM radio. Technology package ($4,410): GPS-linked climate control; 20-in aluminum-alloy wheels; rain-sensing windshield wipers; power-folding side mirrors with LED puddle lights; remote engine start; Acura Navigation System with 8-in color display; color multi-information display with turn-by-turn guidance; rear-door Smart Key entry; blind spot monitoring system with rear cross-traffic alert; Acura/ELS Studio Premium Audio System with 10 speakers, HD Radio and Song By Voice; voice recognition system for navigation, audio, climate control and Bluetooth; email compatibility. Advance package ($6,040; requires Technology package): Idle stop; perforated leather with contrast stitching and piping; heated and ventilated front seats; second-row heated captain's chairs; second-row center console; natural wood accents; heated steering wheel; second-row manual sunshades; two third-row USB charge ports; LED fog lights; auto-dimming side mirrors; front and rear parking sensors; surround-view camera. Entertainment package ($2,000; requires either Technology or Advance package): Second-row bench seating (even with Advance package); 9-in VGA screen and 11th speaker (with Technology package); 16.2-in VGA screen and 12th speaker (with Advance package); two wireless headphones; removable ceiling-mounted remote control. Each MDX comes equipped with the AcuraWatch suite of safety features, which includes lane-keeping assist, collision-mitigation braking, adaptive cruise control and road-departure mitigation. 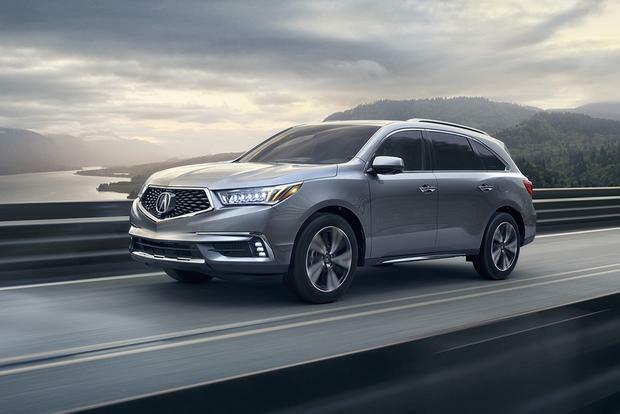 The MDX also gets vehicle stability control, anti-lock brakes with brake assist, LATCH connections, tire pressure monitoring and seven airbags. The National Highway Traffic Safety Administration gives the 2018 MDX a 5-star overall rating, and the Insurance Institute for Highway Safety rated the 2017 model Good in all categories and Superior in the crash avoidance and mitigation tests, the same rating we expect for 2018 when testing is complete. With a curb weight of just over two tons (4,001 lbs), the MDX is a big vehicle, but it's still the lightest in its class thanks to the extensive use of aluminum, magnesium and high-strength steel in its structure. It handles well through the curves but shines in a straight line, where it floats along the road in serene silence and smoothness. 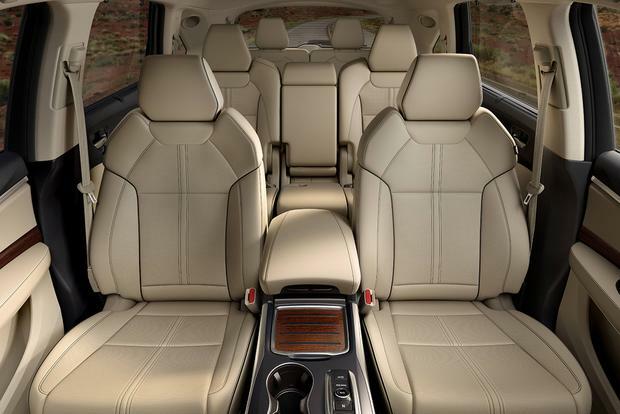 Both driver and passenger accommodations are comfortable, well-padded and roomy. The MDX's engine does a good job of propelling the crossover down the road, but there's still some work to do on that 9-speed automatic transmission -- it's a little too eager to shift up into the next gear and sometimes feels notchy in an unpleasant way. A quick drive down the block will have you in fifth gear before you know it, and when you ask for more acceleration to merge with traffic, the transmission has to kick down a few gears to answer the call. It does so quickly, but calls more attention to itself than we'd like. 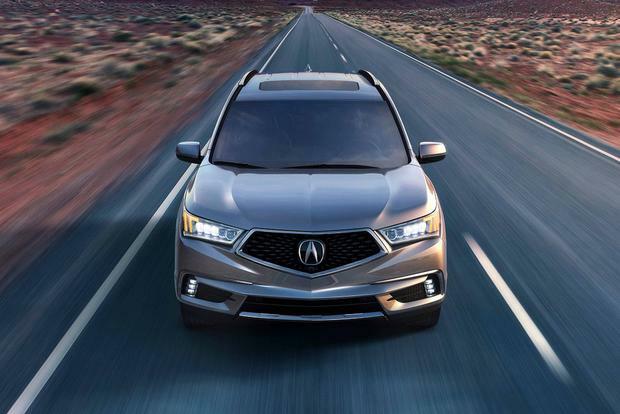 Since the MDX uses a combination of sophisticated electronics, including throttle-by-wire and electronic shifting control, Acura should be able to smooth out this performance with software tweaks. 2018 Infiniti QX60 -- Another tech-laden 3-row luxury crossover, the QX60 comes with a continuously variable automatic transmission (CVT). 2018 GMC Acadia Denali -- GM's 3-row crossover offers slightly more hp and a few more features in a slightly smaller and nimbler package. 2018 Lexus GX -- The GX offers a more rugged design with real off-road capabilities, a more powerful engine and higher tow rating. Used Audi Q7 -- A 2014-2016 Audi Q7 offers a superior luxury and driving experience, more engine options and more distinctive styling. MDX loyalists will not be disappointed in the latest tweak to their favorite 3-row luxury crossover. We're not sure if it will win over any converts from other brands, but the 2018 Acura MDX with the Technology package is the one to look for. It offers the most desirable features, like navigation, blind spot monitoring and premium audio, without the expensive high-end features that come with the $6,040 Advance package. Whichever MDX you select, you'll get a well-sorted, luxurious and roomy crossover that's ready for a road trip.